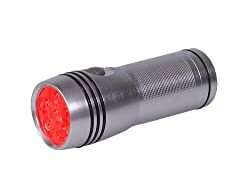 Red LED flashlights are useful for sportsmen, police, emergency personnel, astronomers, and the average person who needs a flashlight that will not spoil their natural night vision. Before the advent of red LEDs, red filters were used on regular flashlights with incandescent bulbs, but aside from the clunkiness factor, the filters also seriously reduced the light output. Red LEDs on the other hand directly generate red light and provide a better, more streamlined night vision protecting flashlight. The big choice you have to make in red LED flashlights is whether you want a unit that is all red LEDs or whether you want one that has bulbs of other colors as well. Below are the best choices in both categories. 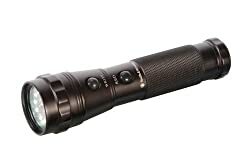 The Maxxima MF-37R Ultra Bright 6 Red LED Flashlight is the ideal specialized red LED flashlight for close-up task work. It has 6 Ultra Bright Xtreme Hi Power Red LEDS that provides over 100 hours of burn time from 4 AA batteries. The body is a precision tooled aluminum extrusion and is water resistant. The street price is around $20. 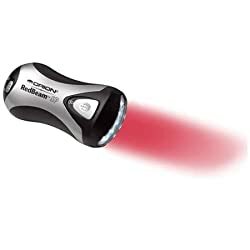 The Orion RedBeam SP Self-Powered LED Flashlight is a red LED with a novel twist – no batteries are required! When Orion says “self powered,” they mean that it is powered by a small hand crank that, when wound, charges an internal rechargeable battery. Just 1 minute of winding cranks out up to 1 hour of red LED light! There are two brightness settings which illuminate either three or all five red LEDs. The Orion RedBeam SP can also be charged from a USB port (USB charge cable included) and it can even power a cell phone in an emergency (five popular cell phone adapters are included). The 6.4 oz until has a street price of about $27 dollars. The Smith & Wesson Galaxy 13 LED Flashlight has 10 White LEDs and 3 Red LEDs and at a street price of about $24.00 is an ideal choice for aviators, astronomers, law enforcement, hunters, campers, and members of the military. The white LEDs handle the heavy lifting, with a 30-hour battery life via three AAA batteries (included). The red LEDs, which last for up to 80 hours on a single set of batteries, are particularly valuable for situations where you don’t want to disturb a driver but still need to read a map, or when you’re hunting in the early morning hours but don’t want to attract too much attention. The Smith & Wesson Galaxy 13 LED Flashlight comes with a deluxe holster and carries a limited lifetime warranty. If you want a bigger and brighter mixed red LED flashlight, a great choice is the Smith & Wesson Galaxy 28 LED Flashlight which has 20 white, 4 red, and 4 green LEDs. It features the latest MSAT switch technology which allows the powerfully bright 20 white LED mode to operate on one switch while the the 4 red LED mode for night vision or the 4 green LED mode for low light color LED modes are activated on a separate switch. These separate on-off push buttons avoid the confusion of a single switch mechanism. 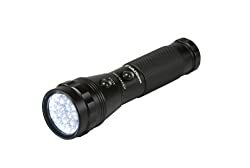 Ideal for aviation, outdoors, automotive, home, and professional use, the 20 LED mode provides a brilliant beam of white light perfect for general usage, while the 4 LED modes are ideal for conserving battery power and signaling and identifying targets at night without hampering night vision. It’s constructed of precision-machined 6063 anodized aluminum for maximum resistance to corrosion and weather. The flashlight also includes 3 AAA batteries and a deluxe holster with a spare battery holder. It’s backed by a limited lifetime warranty. Last updated on Tuesday, September 18th, 2012 at 12:31 pm	and filed under LED Flashlights.